Mackenzy Evers can't believe how close she is with Chance now that they've finally allowed themselves to be with each other. But her past with Varun and her quest for the goddess Vesta's magical stones can tear her away from him forever. Book 2 of the Fire Wars Series. 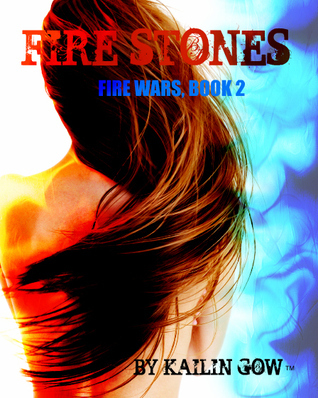 Fire Stones, the second book in Kailin Gow's mythological fantasy series, The Fire Wars, begins exactly where Fire Wars ends. Mac Evers is learning more about her possible life as the goddess Vesta and the stones she created, each with their own purpose. The threats against her life are increasing and becoming more dangerous as she locates each carefully hidden stone. Mac had been one of Kailin's average characters, asking more questions than proactively looking for answers and she didn't really stand out in personality or actions. In Fire Stones, though, it seems as if a switch has been flipped and Mac is evolving into a heroine who makes decisions with confidence, and lets herself believe in what's really happening around her. She could never have been considered a push-over before, but now there's a strength in her actions that shows she's 'sticking it' to her known, and unknown adversaries. Kailin gives readers more of everything with this novel. More action as enemies are revealed, more plot twists as Mac verges on forging her own destiny, and more romance as the heat between Mac and Chance reaches scorching levels of hot! Who could forget the mystery so deeply woven into this series? Fire Stones offers fans glimpses into a shared past between Vesta, Mars, and Neptune (Mac, Chance, and Varun, respectively). The effect of these sensual, or enlightening, dreams is like receiving puzzle pieces and trying to figure out how they all fit together. The Fire Wars series is one to keep an eye on because it will unquestionably burn brighter! Read my review of THE FIRE WARS and my review of FIRE DANCE (book 3/coming soon)!